Hurray! A new comic from good ol’ Mitch, just in time for the latest round of EarthBound news! Too bad that’s not how I (as a new Mother fan) acted. Hehe, c’mon you guys, comics are supposed to be FUNNY. You’re being very silly if you take mitch’s stuff seriously. 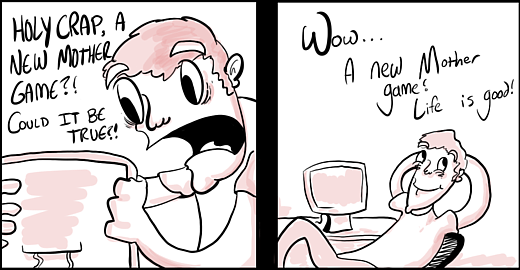 this comic is a true account of my own reaction. i’m pretty new to all of this too! I’m not exactly an old EB fan, but did I never really expected this to be a new Mother game. I’m kind of glad it probably isn’t. I don’t know where they could go with the story etc and wherever they could, it probably won’t be very interesting and ruin a lot of the series for me. 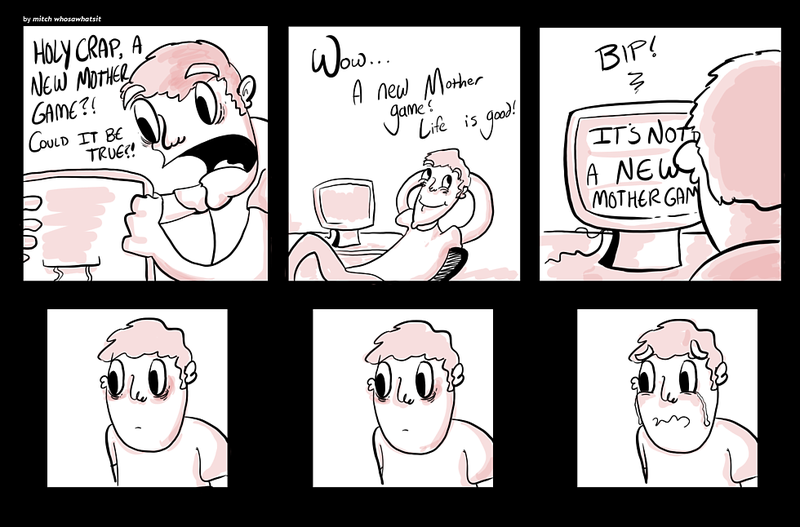 …not a new Mother game? Even better! I would like another series to explore! It’s not like anyone ACTUALLY believed that screenshot was for a new Mother game. I’ve been an Earthbound fan since its SNES release, and I STILL don’t take bad news as well as the second guy from that other strip. Not as bad as this guy, either, though. I tend to get highly annoyed and rant to friends/family/coworkers/anybody I can get to listen to me. With this “Another World” thing, though, I still think it’s SOMEHOW related to Earthbound, even if only as a visual style homage. The look of it makes me want to keep tabs on it, even if it turns out to have basically NOTHING to do with Earthbound at all (other than blatant sprite rip-offs). I can see it now. That screenshot is actually the house outside of the Forest that leads to “My Neighbor Totoro’s” woods.